Changes in life happen to everyone. Some changes are planned, some are unexpected. Some changes we view as positive - a marriage, a promotion, a new child or grandchild, a new home, etc. 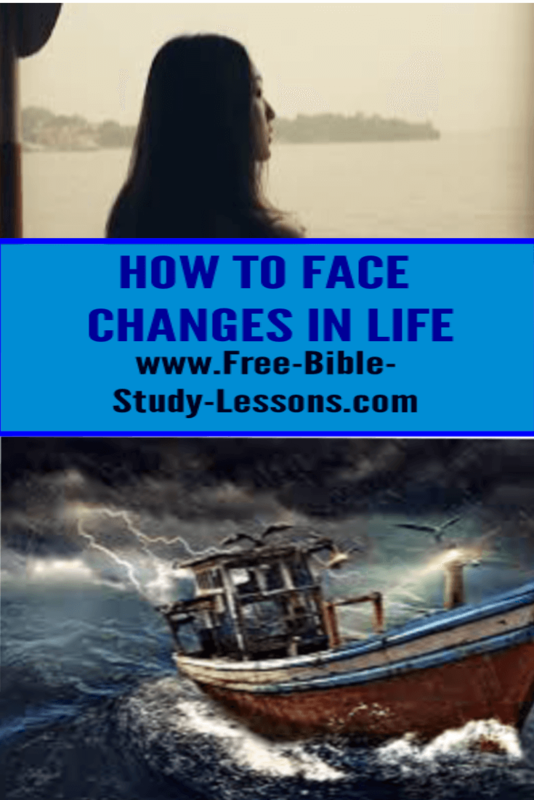 Other changes we view as negative - a divorce, a job loss, an injury, a death, etc. And changes in life - especially negative changes can happen in an instant like lightening out of a blue sky. Forever our life will be different. For the non-Christian - whether they realize it or not - everything in life is fragile and can be lost in the blink of an eye. For the Christian there is always one rock solid constant that will never change. That is Jesus Christ. Regardless of what else happens Jesus will always be there, always be loving, always be caring and always be in control. It is this absolute confidence that can stabilize our lives when the earthquakes of this world threaten to crush us beneath their weight. And not only is Jesus unchanging in this life, but also He is unchanging in the life to come. He is the Constant that is the same for us in this life and beyond. We do not have to fear the transition. We know Him in this life and we will know Him in the life to come. With all this in mind, it should be obvious that developing our relationship with Jesus is the most important thing we can do. It will literally last forever. So how to we approach changes in life, especially changes in life which we view as hurtful and negative? 1. Realize, whether we feel like it or not, Jesus is in control. He has allowed this to happen for a greater good for ourselves and for others. This is where faith and trust come in. In the dark times it is good to spend extra time reading and mediating in the Word, especially the Psalms. 2. Take positive action. Sometimes there are things we can do to change the “change.” We need to access the situation. What can we do? Can we reverse it? Can we work to overcome it? Can we use it as an opportunity for ministry? Sometimes there is nothing we can do but accept it with a positive and trusting attitude. That too is action. Do not let it drive you to bitterness and anger. 3. In light of the above points, let it drive you to Jesus - the Unchanging One - not away from Him. Satan likes to use these things as a wedge to drive us away from Jesus. The Holy Spirit uses these things to cement us to Jesus. Who are we listening to? 4. In the cases where we can see changes in life coming in advance, we should not ignore them but do what we can spiritually, mentally and physically to prepare ourselves for them. Christianity is not about hiding from the real world, but learned to live pleasing to God in the real world. Honestly, I don’t know how the non-Christian even copes in life without Jesus. I know I would not even want to try it. No matter what changes or things come at us in life, Jesus, our Lord, Love and Savour, is constant.